I am not a nurse. I wasn’t born with the genes for nursing, but I work alongside nurses each day. They’re busy from the second they clock in at the nursing home until they leave, often working overtime to finish their patient notes or working a double shift. Some residents are demanding and unappreciative, yet the nurses still devote their time to providing the best care. They have bus-size more patience than me. Last week, I had the surprise of observing from the flip side—from a hospital bed, a humbling position. From the moment the admitting nurse handed me a white cotton gown with the blue diamond print, snaps on shoulders, and open back, I was humbled. The ties, dangling at the side, are completely useless and do nothing to improve the silhouette. One size fits all. Lying on that hospital bed, I was quickly transformed into a patient, dependent on nursing care. It’s hard to do much when your arm is attached to an IV pole. Of course, I wanted to get better, so I let the nurses invade my personal space and check vitals every hour. I appreciated their compassion, their thorough care and friendly smiles even at 4:00 AM. I was thankful for each act of kindness. After a few days there, when I was desperate to get clean, one nurse wrapped my IV in plastic and tape so it wouldn’t get wet, and I could shower. Another nurse stopped to talk to me about the books she enjoys and ask what I’ve written—took my mind off where I was for the moment. In the morning, a nursing assistant sang “Jesus is the Answer,” a church song I loved from years ago, while she made my bed. Nurses were often in my room helping the patient next to me. She was suffering with excruciating pain and called for help day and night. The nurses answered every time. And the call bells kept ringing. I’m home now, but I’ll remember the faces of the nurses—the light in a depressing place. I thank God for all those blessed with the nursing gene. They are an example of “The Good Samaritan,” what God desires us all to be. the great gift of God’s grace. to our Savior, Christ who reigns. If you have ever watched the movie Terms of Endearment, you must remember that humiliating scene at the supermarket. That was me last night. Tired after work, I drove with my oldest son, Stephen, to CVS for a few items because…you know they did use the word Northeaster for the storm coming. And of course we can never find the fifty flashlights and batteries we bought in the past years. And three gallons of milk might not be enough for our four grown-up sons and teenage daughter. I prefer using the self-checkout line so I have control, can change my mind, decide I don’t really need a bag of M&Ms, but none of those registers were working at CVS last night. 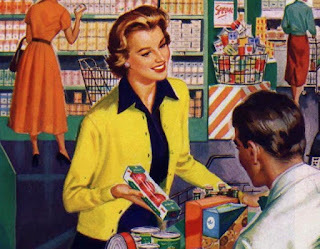 The young blond didn’t look happy that I had about twenty items—I had to get more stuff because…you know when a storm is coming, you need extras like macaroni and cheese and soup and toothpaste. Anyway, I’m holding out my important CVS card and coupons because…of the storm…I got more stuff than expected and couldn’t have the total go over the sixty dollars in cash I brought. Then the girl hits total before she notices my coupons held in front of her nose. I didn’t say that she should have asked if I had coupons before hitting total or this wouldn’t have happened if they ever fixed the stupid self-checkout registers. I just watched her miserable face as she rechecked the items. If I brought more money, I would have skipped the coupons, but couldn’t do that since I cut it too close. It was the storm’s fault. He held open an empty wallet. I was thankful when he swiped his card so it was done, but I still had to pack my twenty-something items in the two bags I brought. Too late to pay for another bag. When I’m anxious, my hands feel like they’ve got butter-slathered mittens on trying gather falling cereal boxes. No help from the blond who didn’t smile. Stephen helped me grab the rest of the stuff, and I rushed out without looking at the faces of the people in line. At least no one said anything out loud. I realized two things when I got home: One. I accidentally bought the more expensive paper towels—the reason I was off by a dollar. Two. I forgot the flashlights and batteries. If the Northeaster slams us, at least we’ll have plenty of toothpaste and the heavy duty paper towels to clean up what we spill in the dark. Why was I so embarrassed at such a small flake of life? Paying a cashier in an orderly fashion is hardly a death or life matter. The answer has to be pride. I don’t want to make mistakes no matter where I am or what I’m doing, big or small. God doesn’t care about perfection; he cares about our heart and how we treat others. Maybe in my failure, God was pleased I kept my mouth shut. Dinner time used to annoy me. I get squeamish touching and smelling raw meat, but I can deal with that phobia. My annoyance had less to do with the food preparation than the family dynamics. We cooked for at least an hour, gathered our five kids, prayed and gave thanks to God, then listened to them joke and tease each other, and in ten minutes waved goodbye as they cleared the table and ran off to their video games or whatever. As they reached the teen years, it was even harder to keep everyone together, unless cake was served of course. Now dinner is a fun, loud, competitive time. We are not fighting over who gets the biggest meatball or who has to exert energy, stand up, walk to the refrigerator and retrieve the milk. We are playing trivial pursuit. Split into two teams, each team gets a card and alternates in asking the questions. No board or rainbow colored pieces necessary. Playing as a team takes the pressure off one person feeling stupid. I have memories of dreading Trivia. My brain used to freeze under pressure. And occasionally still does. Maybe a bit more than occasionally. Okay, my stupid brain freezes a lot, but I don’t care—we’re not playing to win a million dollars, just to win more time with our family. We usually stay at the table at least an hour, even longer if teams are tied. Because of jobs, college, and sports, we don’t always have everyone at the table, but even if it’s just one of them, we stay and play a round of trivia. Sometimes we have more than seven at the table—friends are welcome to join a team. The more, the merrier. Last Sunday, the guest pastor at church mentioned how God wants us to linger in his presence. This reminded me of our dinner/game time. Our Father in heaven loves his family more than we can understand, so it makes sense that he wants to spend time with us. Jesus spent time with his disciples teaching, healing, but also eating, talking, and resting with them. And he wants that time with us too. When we linger somewhere, it’s because we are reluctant to leave what we are doing; we want to stay. God wants us to seek him. He wants everyone to come to him. The more time we spend in prayer and reading God’s word, the more we will learn about his love for us. It’s trivia time with our Heavenly Father. Note: all verses are found in the NIV Bible unless stated. Second note: we have played other games that work well at the dinner table too: Family Feud and Head’s Up on the iPhone are fun alternatives to Trivia. If you liked what your read, please leave a comment, follow me, or check out my website.